My main set of speakers was sounding awful and I discovered the foam surrounds had completely rotted and were sitting in a pile of debris behind the grilles. Naturally I decided to replace them with giant eyeballs! My research so far has found the following options. I will keep this page updated as I discover more. 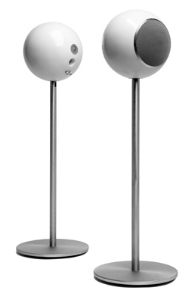 My dream speakers for sure, but for $26,000 a pair, I’ll buy a car, thank you. Those were not the most expensive, though. Fascinating and artsy, but for $150,000 a pair, I’ll buy a small house instead. 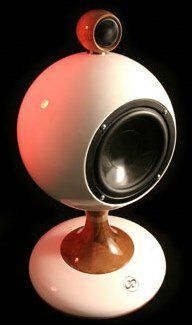 They do have other models, such as the IO2 at just over $3000 a pair, but they aren’t quite as “grand” as the La Sphere. Art deco at its finest. These beauties will set you back $19,000 per pair for the T1 and $33,000 per pair for the T2. The T2 units come with built-in subwoofers. They have many models – all fabulous works of art. They have ignored my requests for a quote. Perhaps they figure if I have to ask, I can’t afford it. They’re probably right! Classy art deco speakers made of hand-carved wood. They also have several other models in natural oak. They haven’t gotten back to me on price, but I can guess “hand carved” = “pretty expensive”. Nicely done and not too expensive at $1350 for the pair. The wide base makes them best suited for bookshelves, though stands are available. 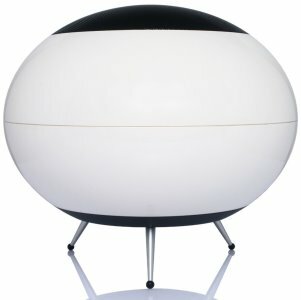 This 11″ French speaker runs about $1300 for the pair with floor stands (+$200 shipping because there is no US dealer). No need to put off buying a car or a house. They also make a "Sound Tree" with 6 or 12 eyeballs hanging from the ceiling! This one is designed to hang from the ceiling. 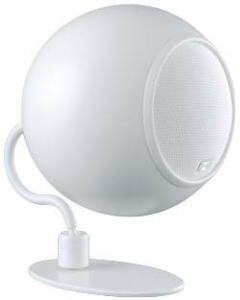 These 5″ speakers are mainly intended as ceiling or satellite speakers and would definitely need a subwoofer. 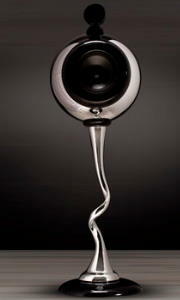 I particularly like the curvy eye stalks, er, I mean floor stands for these. About $800 for a pair with stands. 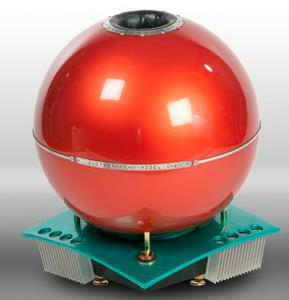 These are available in home theater kits, but their subwoofer is not spherical! These are the most affordable by far. They sell direct, saving you money. A pair of Mod1s with stands runs only $460. 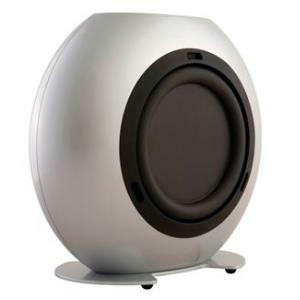 You would likely want a subwoofer to go with them, but sadly Orb’s subwoofers are square! Go figure. This is a non-powered woofer, not a subwoofer. 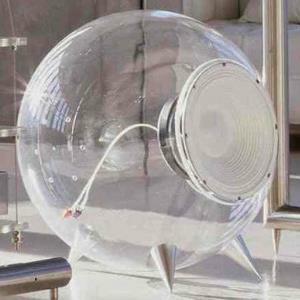 A set of these transparent speakers includes separate components. 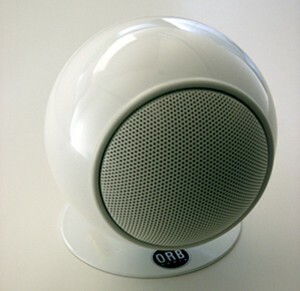 Only the woofer is spherical – the main speakers are large oval dishes and the subwoofer is square. A missed opportunity. These aren’t terribly useful without their oval dish partners. 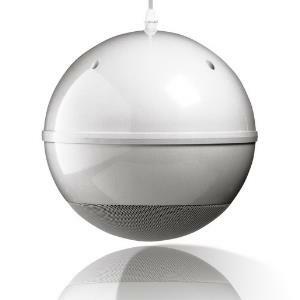 A transparent spherical subwoofer would have been awesome. This is my favorite subwoofer. Unfortunately the price is as awesome as it looks at $5500 for the 200 watt version. This would go especially well with steam-punk decor. More reasonably priced if not as fancy, this goes for about $1500 and the amp is 500 watts. 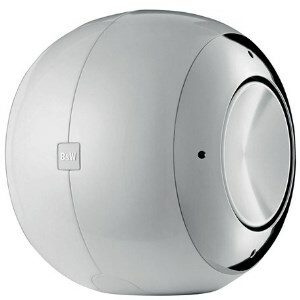 B&W is a popular audiophile brand famous for their much more expensive speakers. The white ones are shown on the UK version of the web site, but not the US version, so they may be a little harder to get in the US. Available in three colors with power at 100 watts for the PSW8 and 200 watts for the PSW10. 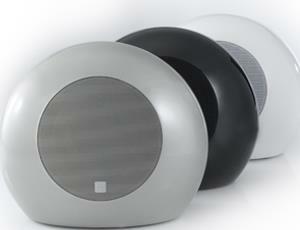 Available in both wired and wireless versions with power at 200 watts. 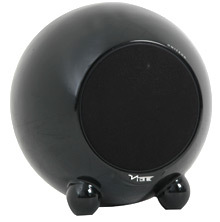 These are pretty easy to find on the web and in stores and typically run $900 for the wired and $1200 for the wireless. Available in silver and black. I wish they didn’t have that flat spot on top, but they’re still pretty cool. 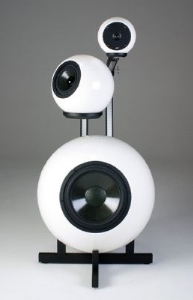 This one is the most eyeball-like of all the subwoofers, though is only available in black. It is discontinued and thus may be hard to find. 70 watt, 8 inch, 4 ohm subwoofer. The Ball with a set of “spikes” runs $600 on Amazon. At 60 watts with a long throw 6.5″ driver, it’s not as high-powered as the others. 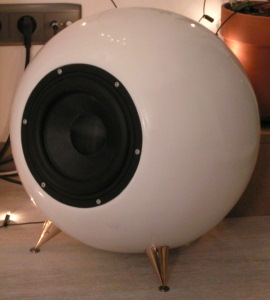 My favorite subwoofer of the white eyeball variety is this home made one. Unfortunately, he never got around to posting his build logs and plans. He made it to go with his Orbs. There were many other “bullet-shaped” speakers that I did not include because they didn’t shout “EYEBALL” quite as loudly as the spheres. If I missed any speakers with “eyeball potential”, please let me know. I will no doubt end up with a pair of the cheaper ones, but it’s fun to see the others. If I got any of the prices wrong, please send me a message and I will correct it. A couple folks have asked about the “Magic 8 Ball Eyeball” in the movie “The Haunting in Connecticut”. Sorry to say, this is not a commercial product. According to the director’s commentary on the DVD, they “were not allowed to use the Magic 8 Ball that was originally written in the script.” In the actor commentary, Virginia Madsen says “I love that eye thing. I’m telling you they should make that and market it” and the director acknowledges it is a prop made for the movie. Be sure to watch the last deleted scene on the DVD – the eyeball had its own scene that was cut. I did pitch an “eyeball eightball” (along with 19 other eyeball toys) to a couple toy companies in 2002, but was not able to generate interest. The only eyeball 8-ball I have carried was a small version that also came with candy called the “Magic Eyeball Keychain” from about 2001. There was also “Madame Zelda’s Crystal Ball” from about 1999. I decided not to carry that one because instead of being an eyeball with a message in the pupil, it just had an eye printed on the side – a missed opportunity. 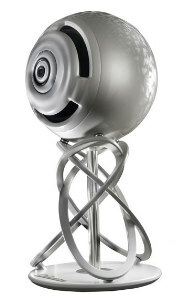 I did a search for a “virtual” Magic Eyeball and found this one and this one. I also found two iPhone apps. One is called “myEye” and the other is called “Magic Eyeball”. But again, all these virtual magic eyes feature an eye (in its socket), not an eyeball. Why does no one seem to notice the roundness of the Magic 8-Ball? New News Blog for the Eyeball Museum! I just added this to the site and am still configuring it. Please let me know if anything doesn’t work! Look for more frequent news updates in the future. Dorsey Krouse on Listen To Your Eyeballs!